Our friends at youbentmywookie strike again! 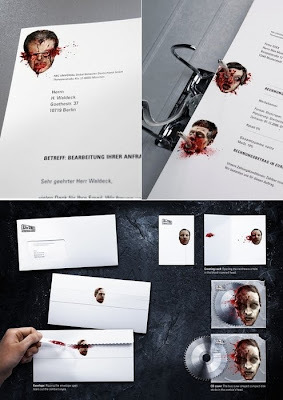 This time, they have uncovered some sweet zombie stationary. 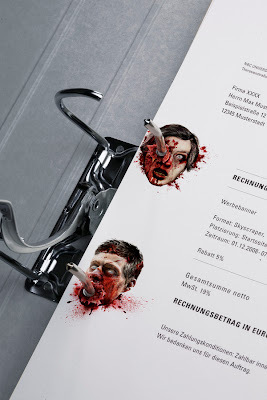 Designed by the Jung von Matt ad agency, the stationary is a zombie fan's dream. 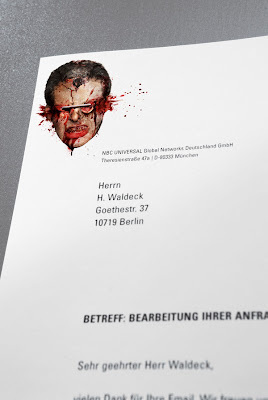 The stationary was made for NBC Universal's action and suspense channel, 13th Street, in Germany. So if any of our readers on the other side of the pond work for television studios and you need my address, just shoot me an email. I'd like some of that, too! OK this is one of the most crazy zombie things that I never seen in this world, inclusive if you want to bring some zombies to your class, this is the best way.